Dirk Nowitzki became the highest-scoring international player in NBA history on Tuesday night, passing Hakeem Olajuwon. After the game, Nowitzki praised Hakeem. He said he tried to replicate Olajuwon’s famous “Dream Shake,” but failed, so he created his own signature shot. Nowitzki is being humble, of course, because his patented step-back jumper — where he leans back at a steep angle, jumps off one foot, and shoots over a defender — is one of the most difficult, unguardable shots in the NBA. Other NBA players have tried to master it, but no one does it as good as Dirk. “I was never the fastest guy beating somebody off the dribble, so I had to come up with something to create a little separation. The step-back is a good way of just creating a little separation and still get the shot over them. The separation Nowitzki creates is key for the shot. ESPN’s Sports Science did a feature on the shot and concluded that Nowitzki leans back at about a 20-degree angle while also hoisting his right leg. Combined, it creates almost three feet of separation between him and his defender. 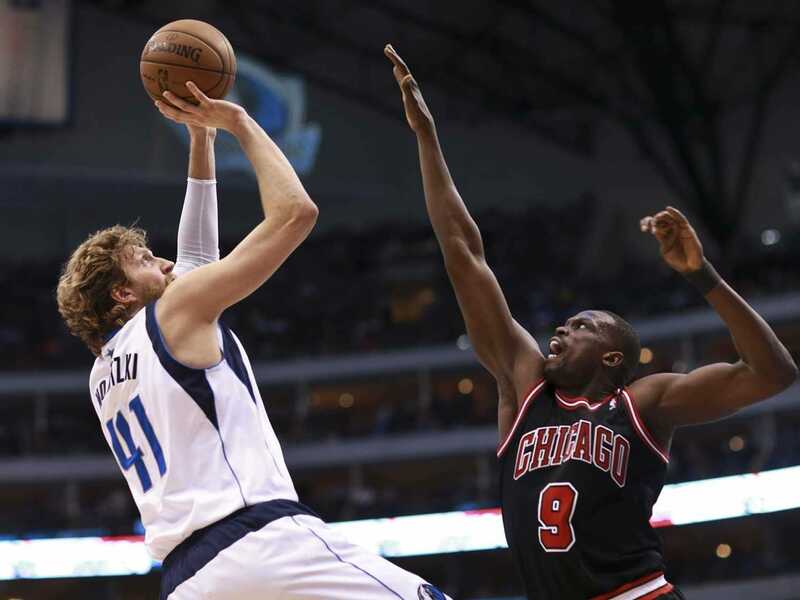 Nowitzki says he started using the shot more and more as he got older, and it has paid off. The consistency of the shot is insane. Nowitzki’s form is established and he shoots it the same way every time. He also makes life easier on himself by taking it from close range. According to NBA.com/Stats, Nowitzki is 8-for-10 on fadeaway jumpers this season, and almost 60% of his shots have come from midrange, where he’s hit 57% of his attempts. Last season, Nowitzki’s volume of fadeaway jumpers was far higher and far more accurate than the rest of the league’s best scorers. The shot is so tough and unguardable that players like LeBron James, Kevin Durant, and Carmelo Anthony have all emulated the one-legged step-back. James told the Sun Sentinel in 2011 that Nowitzki’s patented jumper is the second-most unguardable shot in the sport of basketball, behind only thy sky hook.